We at Quilt Sandwich held our second Charity Quilt Show on the 11th & 12th March 2016 at The Royal Bridlington. This time our chosen charities were - The Yorkshire Air Ambulance, The Childrens Hospital Sheffield who are raising money to purchase a special scanner which will allow them to operate and scan at the same time - this will be one of only 2 in the world & East Riding Domestic Violence and Abuse Partnership for their safe houses. Quilters from all over the UK donated fabrics, UFO's, Orphan blocks & quilt tops and volunteers came along for a Quiltathon and made quilt tops in return for a free lunch and refreshment throughout the two days. 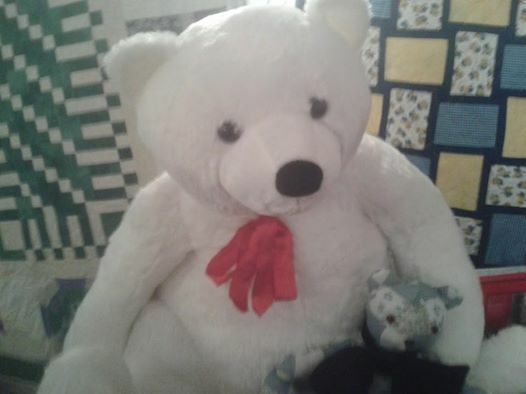 Lorraine Hall who works at Peter Duffys asked her work colleagues for unwanted Xmas Presents to donate to our raffle and she came with a heap of goodies including Beautiful George - a massive Teddy Bear. Thank you Lorraine - it was a great idea. Lots of quilt tops were made and this resulted in Tim & myself giving up our annual holidays and quilting over 70 of these on our longarm. Many thanks to Carol Barrow, Barbara Hall & Chris Sunderland who hand sewed the bindings. We had over 80 quilts on display. We also made a couple of quilts to go online and raffle and we did this via Just Giving. Scrappy Happy Houses was made for the Childrens Hospital and this quilt raised £281.53. 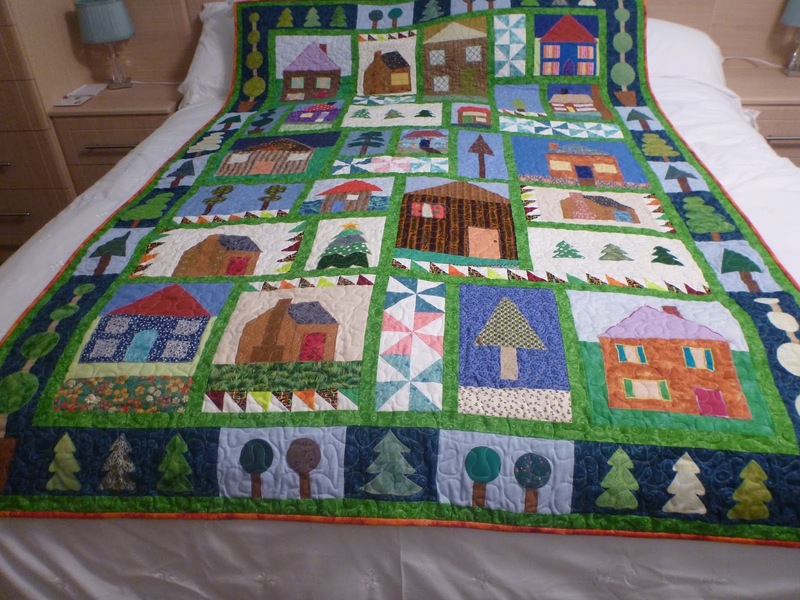 The ladies who volunteered their time to come to the quiltathon were asked to make houses and tree blocks and these were beautifully put together by a local lady - Jackie Woolford. Thank you Jackie you did a wonderful job with this quilt. On the open days we served refreshments and sandwiches to those who came along and were very grateful for Diane Davison volunteering her services in the kitchen. We also had a tombola, raffle, sales stall and cake stall. 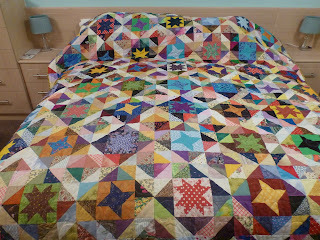 All the quilt s were for sale by negotiation and those left will be donated to the charities. Despite a very poor show from local quilters and quilt groups we managed to raise over £2,500 for the Charities and those that did come travelled from far and wide and many have sent emails of thanks. 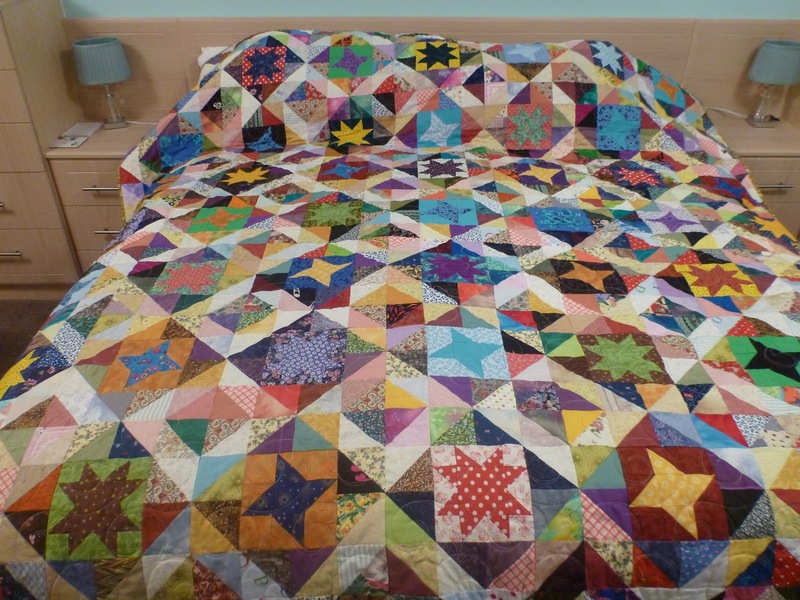 We would like to thank all those who came along to the quiltathon in January and all the volunteers who helped on the days of the quilt show - your assistance was very much appreciated. A special thanks to Rowena Smith who also helped on both the days, but also helped us putting up the quilts. On Saturday, we were delighted to welcome The Mayor of Bridlington - Cllr John Copsey. This lego quilt was made to show that even small scraps can be used. Running workshops and retreats here at The Royal Bridlington, it never ceases to amaze us how much good fabric is put in the bin. These 1.5 inch pieces were sewed together into 12 inch blocks from some of this fabric then sashed. Bridlington Sewing Centre, Janome, Lloyd Dowsons, Richardsons Greengrocers, Peter Duffy Ltd, Bidvest, Hopwells, Yorkshire Coast Radio, BBC Radio Humberside, Bridlington Free Press, Wimborne Fabrics (Moda), Patchwork Promotions, Popular Patchwork, Quilting For you, Todays Quilter, British Patchwork, Pelenna Patchworks.